Foes and backers dispute whether there are plans to transport the substance to Casco Bay. This story was updated at 10:50 a.m. 1/27 to correct where the tar sands oil is extracted from. 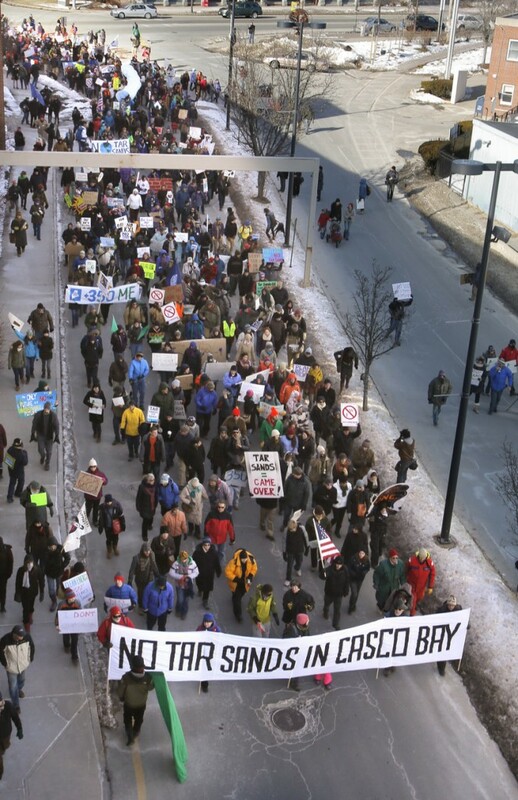 PORTLAND – More than 1,400 people marched from Monument Square to the Maine State Pier to protest the possible use of the Portland-to-Montreal oil pipeline to transport tar sands crude oil to Casco Bay. 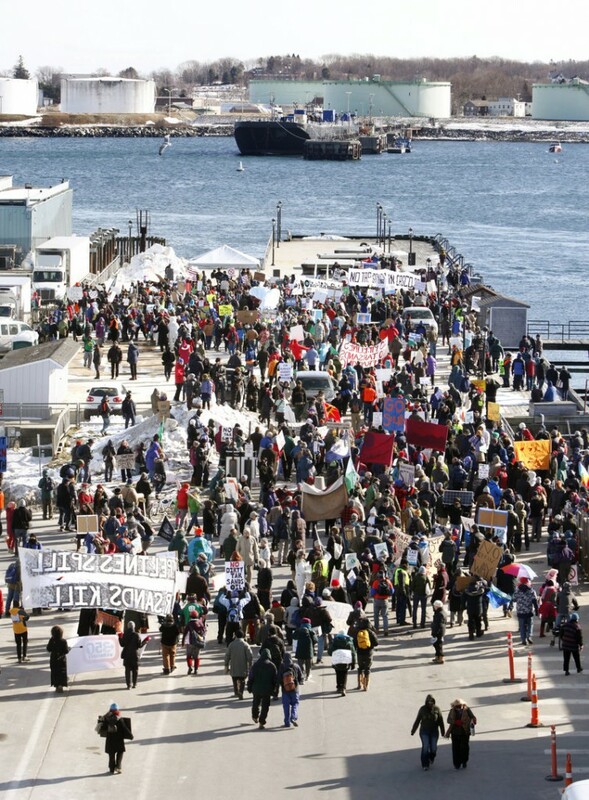 Demonstrators head to the Maine State Pier on Saturday to voice their opposition to piping tar sands oil through the region. Officials with the Portland Pipe Line Corp. say there is no existing plan to transport tar sands oil through the Portland-to-Montreal Pipe Line. Donna Brown, left, and her husband, Jason, huddle against the wind while listening to speakers at the anti-tar sands rally Saturday. Billed by organizers as the largest rally against tar sands oil in the Northeast, the protest featured more than a dozen speakers, including U.S. Rep. Chellie Pingree, D-1st District, and Portland Mayor Michael Brennan. “I’m going to ask the Obama administration to do a full environmental review of any attempts to pump tar sands through that pipeline,” said Pingree. Portland police estimated the crowd at between 1,400 and 1,500 people. Most other protests against either the use of tar sands crude oil or the Keystone XL pipeline — proposed to transport the oil from Canada to U.S. refineries on the Gulf Coast — have been sporadic and smaller than the one in Portland on Saturday. Protesters, many of whom arrived in Portland on chartered buses, didn’t seem to mind the biting cold. Carrying a sign that read “Don’t stick your head in the sands,” John Ersek of Gorham said he showed up at the urging of his daughter, Olivia. “The protest was my daughter’s idea. I came up with the sign,” he said. Portland Water District Trustee Brad Cleaves of Portland was also on hand to protest piping tar sands crude through the region. “It will definitely jeopardize our water supply,” said Cleaves. The rally was the latest move by tar sands opponents to spread their message that oil companies are planning to move tar sands oil through the 236-mile, 62-year-old pipeline, which runs from Vermont to New Hampshire and through the Sebago Lake watershed to South Portland. The producers of tar sands oil and other proponents, including the pipeline’s owner, the Portland Pipe Line Corp., continue to insist that there is no plan to use the pipeline for tar sands oil. They also say opponents exaggerate the environmental risks of tar sands oil. The New England Petroleum Council in Boston issued a statement last week calling into question protesters’ concerns about the safety of tar sands oil. Enbridge, the company that operates the Canadian pipeline from Ontario to Montreal, said Friday it had no plans for the Montreal-to-Maine pipeline. Tar sands oil — also known as diluted bitumen — is extracted from sandy soils in Alberta. A study financed by the Canadian government released earlier this month found development of the oil sands had increased the amount of cancer-causing compounds in surrounding lakes. Opponents of the shipment of tar sands oil to the U.S. say it increases the country’s dependence on oil and will add to emissions that contribute to global warming. They also say tar sands oil is extracted using methods similar to coal strip mining, which will damage the northern Canadian forests where the oil is drawn, and transporting and refining it poses risks that are much greater than those involved in drilling, shipping and refining conventional crude oil. The Natural Resources Defense Council late last year issued a detailed report on tar sands oil, charging that it is highly corrosive and acidic and can weaken the pipelines that carry it, increasing the risk of spills. They also say the pipelines that carry the oil must operate at higher temperatures and pressures, two factors that they said could make a leak involving tar sands crude more devastating than a leak involving regular crude oil. Extracting, transporting and refining tar sands crude also requires much more water and energy than conventional crude, the NRDC said. Proponents, however, say tar sands oil is no more corrosive or dangerous than conventional crude. They also note that Canada has adopted stricter air and water quality standards to mitigate the impact of extracting and transporting tar sands crude oil. Exploiting a new source of oil, they add, creates jobs, protects those jobs that are dependent on the use of oil and also lessens U.S. dependence on oil from the Mideast. “The oil sands production process is not the ‘vast and destructive’ industrial operation” that opponents describe, John Quinn, executive director of the New England Petroleum Council, said Jan. 21 in an Another View editorial in the Portland Press Herald. He said tar sands oil extraction has affected less than 0.2 percent of Alberta’s forests, and a tract of the forest about the size of South Carolina is under federal protection and is off-limits to extraction efforts. 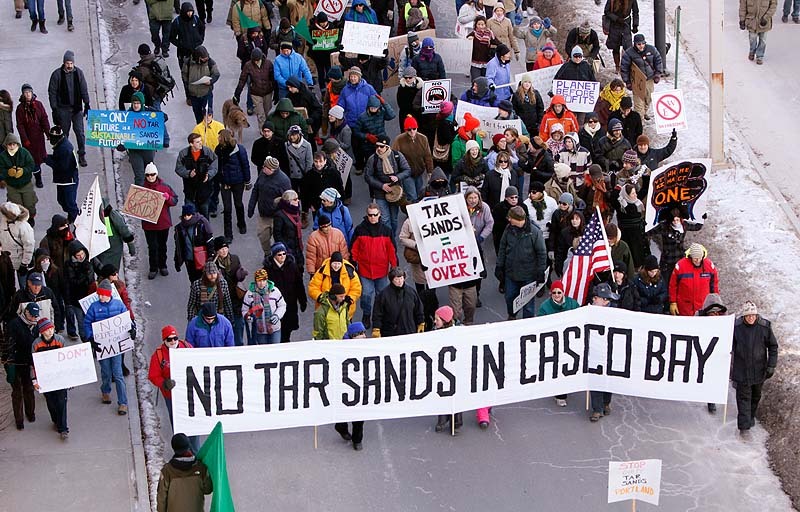 Earlier this month, Casco voters approved a resolution against moving tar sands oil through the pipeline, which runs through their town. Burlington, Vt., has passed a similar measure. The Windham Town Council will hold a special meeting at 7 p.m. Tuesday at the town offices to hear Environment Maine’s request for an anti-tar sands resolution. Last week, the Portland City Council referred a measure that would have banned the use of tar sands oil products back to its Transportation, Sustainability and Energy Committee for more review.